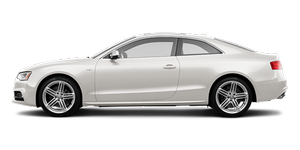 Audi positions both its A5 and S5 convertibles to compete with luxury droptops like the BMW 3 Series, Infiniti G37 and Lexus IS C, and the German automaker is onto something with the S5. Though pricier than its peers — and perhaps a bit more nose-heavy than its A5 sibling — it delivers a unique brand of fun that's worth checking out. In an age when folding metal hardtops are becoming the norm, however, some will be turned off by the S5's cloth soft-top. It will be interesting to see if the car's comparative versatility is attractive enough to make up for it. The A5 and S5 coupes are identical cars, save their performance aspects, and both are newly available as convertibles for 2010; the Germans call them cabriolets, but I'll stick to English. The A5 and S5 convertibles succeed the dated A4 and S4 convertibles; click here for a comparison of all four models. I'll focus here on the S5's performance aspects. For a broader review of the car, check out our A5 convertible review here.